(Nanowerk News) Imagine owning a television with the thickness and weight of a sheet of paper. It will be possible, someday, thanks to the growing industry of printed electronics. The process, which allows manufacturers to literally print or roll materials onto surfaces to produce an electronically functional device, is already used in organic solar cells and organic light-emitting diodes (OLEDs) that form the displays of cellphones. Although this emerging technology is expected to grow by tens of billions of dollars over the next 10 years, one challenge is in manufacturing at low cost in ambient conditions. In order to create light or energy by injecting or collecting electrons, printed electronics require conductors, usually calcium, magnesium or lithium, with a low-work function. These metals are chemically very reactive. They oxidize and stop working if exposed to oxygen and moisture. This is why electronics in solar cells and TVs, for example, must be covered with a rigid, thick barrier such as glass or expensive encapsulation layers. However, in new findings published in the journal Science ("A Universal Method to Produce Low–Work Function Electrodes for Organic Electronics"), Georgia Tech researchers have introduced what appears to be a universal technique to reduce the work function of a conductor. They spread a very thin layer of a polymer, approximately one to 10 nanometers thick, on the conductor's surface to create a strong surface dipole. The interaction turns air-stable conductors into efficient, low-work function electrodes. The commercially available polymers can be easily processed from dilute solutions in solvents such as water and methoxyethanol. "These polymers are inexpensive, environmentally friendly and compatible with existent roll-to-roll mass production techniques," said Bernard Kippelen, director of Georgia Tech's Center for Organic Photonics and Electronics (COPE). "Replacing the reactive metals with stable conductors, including conducting polymers, completely changes the requirements of how electronics are manufactured and protected. Their use can pave the way for lower cost and more flexible devices." To illustrate the new method, Kippelen and his peers evaluated the polymers' performance in organic thin-film transistors and OLEDs. 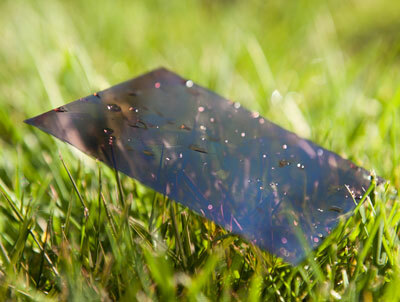 They've also built a prototype: the first-ever, completely plastic solar cell. "The polymer modifier reduces the work function in a wide range of conductors, including silver, gold and aluminum," noted Seth Marder, associate director of COPE and professor in the School of Chemistry and Biochemistry. "The process is also effective in transparent metal-oxides and graphene." COPE is a collaborative effort of Georgia Tech professors in the Colleges of Engineering, Sciences and the Ivan Allen College of Liberal Arts. The center is working on the next generation of electronic devices in order to save energy, reduce costs, increase national security and enhance the quality of the environment. Researchers from the groups of Georgia Tech professors Jean-Luc Brédas and Samuel Graham, as well as Princeton University Professor Antoine Kahn, also contributed to the new study. The research was funded in part through the Center for Interface Science: Solar Electric Materials, an Energy Frontier Research Center funded by the U.S. Department of Energy, Office of Science, Office of Basic Energy Sciences under Award Number DE-SC0001084, by the STC Program MDITR of the National Science Foundation under Agreement No. DMR-0120967, and by the Office of Naval Research (Grant No. N00014-04-1-0120). The content is solely the responsibility of the principal investigators and does not necessarily represent the official views of the DOE, NSF and ONR.